Heat the oil and fry the onion for 8-10 minutes in a large frying pan with a tight-fitting lid, until soft and golden. Add the jar of curry paste and stir well. Add the rice and cashew nuts, stir well and cook for 2-3 minutes. Add the coconut milk. Pour in 425ml of boiling water, bring to a gentle simmer then cover with the lid and cook for 8 minutes. Do not remove the lid. Heat a griddle pan and cook the medallions for 5-6 minutes on each side or until thoroughly cooked. Remove the rice from the heat and leave covered for a few minutes. Fluff with a fork and serve garnished with the coriander. 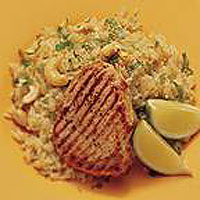 Top with the pork medallions and sprinkle with fresh lime juice.